Where are you broken? Where are you hurting? What part of you is cracked? You may agree, that over time, it is precisely there - in that devastated part of you - that you have gained insight and growth. By attempting to understand, by finding ways of dealing with the pain, heartbreak or suffering, the roadblocks, the barriers and naysayers, the negativity that invades you, the mountains that seem to loom in front of you ... by learning how to deal with this lucidly, consciously, and not by the road of building defense mechanisms, you eventually find some light. (As I write this, Nelson Mandela's Memorial Service is being celebrated - he and what he did with his life - is an excellent example of finding light in the cracks). Leonard Cohen epxressed it beautifully: There is a crack in everything. That's how the light gets in. 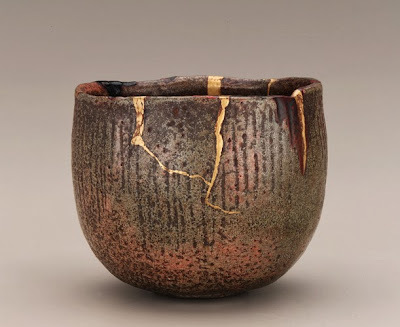 Be grateful for the cracks. They are not your enemies but your enlighteners.